The New Democrats have reached a record level of support among decided voters in Newfoundland and Labrador, narrowing the gap with the PCs in a new poll. Newfoundland and Labrador's New Democrats have reached a record level of support among decided voters in the province, narrowing the gap with the governing Progressive Conservatives in a new poll. 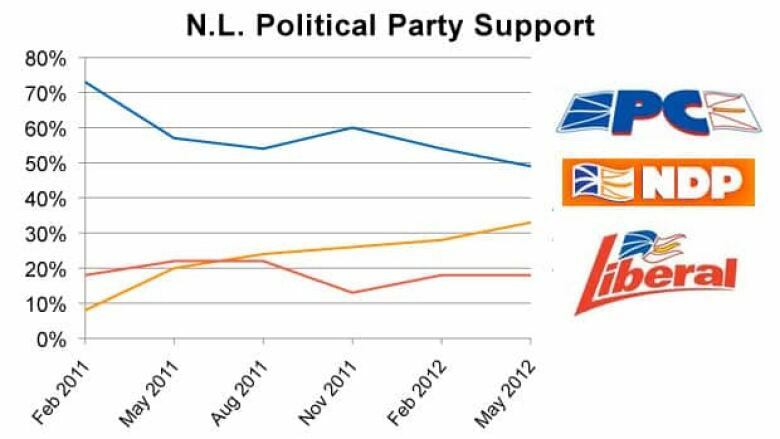 The NDP now has the support of 33 per cent of decided voters, according to Corporate Research Associates. The Tories are at 49 per cent, while the Liberals are in third with 18 per cent. Currently, six in ten residents — 60 per cent, down from 73 per cent three months ago — are either completely or mostly satisfied with the performance of the PC government, CRA says. The number of unsatisfied respondents has climbed to 33 per cent from 21 per cent over the same time frame. Premier Kathy Dunderdale told reporters Thursday that the results — which are far lower than when she succeeded Danny Williams in late 2010 — are nothing to worry about. "I would go to an election tomorrow on these numbers," she said. "You know, these aren't bad numbers. Look where my opposition is." The latest CRA poll found that Dunderdale and the Tories have slipped substantially in all key measurements, including party standings, satisfaction with the government and choice for premier. 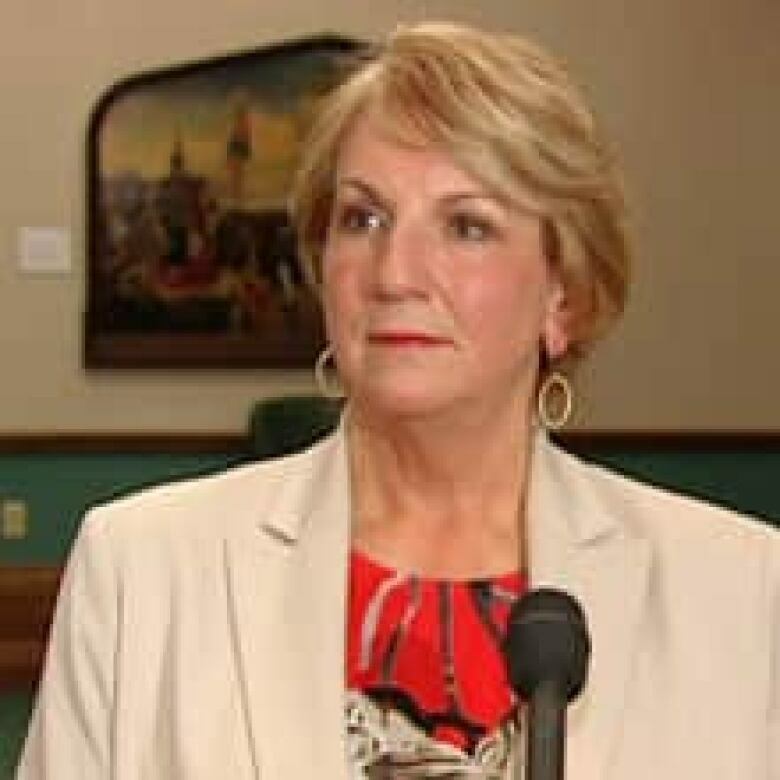 When asked which of the leaders they would prefer as premier, 44 per cent picked Dunderdale, down from the 59 per cent recorded in November, just a month after Dunderdale led the PCs to a third straight term in government. The poll also suggests that NDP Leader Lorraine Michael is not enjoying a personal surge to match that of her party. About 23 per cent chose her as the best pick for premier, only a point higher than the last poll in February. About 12 per cent chose Liberal Leader Dwight Ball, down a point from February. Don Mills, the chairman and CEO of CRA, said while the poll shows a drop for the Tories, the results need to be taken in context. "I don't think these numbers are actually bad," Mills told Here & Now. "I think they're actually more normal than what has been the case in the past ... She's still twice as popular as the next leader." Mills noted that the poll was conducted while some tough news, such as cuts in the health care system and in other government services, had been announced. "We'll see over the next poll or two whether this is a levelling-off or a continuing downward trend," he said. Mills said he believes the performance of the economy will have a direct bearing on the next poll results, as well as developments in consumer confidence. CRA surveyed 802 adult residents of Newfoundland and Labrador between May 10 and June 4. The pollster says overall results for the province are accurate to within plus or minus 3.5 percentage points, in 95 out of 100 samples.